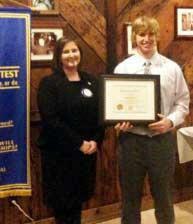 The Brook Hill School’s Student of the Month for December, presented by the Bullard Rotary Club, is Kendall Kerns. He is a member of the National Honor Society, and the Dallas Patriots baseball club. In addition to his club involvement, varsity baseball at Brook Hill and was a member of the 2011 state championship squad. Kendall has been named defensive most valuable player, firstteam all state in 2011 and the 16- and-under Patriot of the year. His hobbies include playing baseball, hunting and fishing. After he graduates, he plans to play baseball in college.